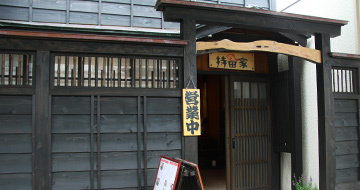 Sado Kinzan Gold Mine’s “G-grade Cuisine”! Let’s promote the registration of Sado Kinzan Gold Mine as a World Heritage spot from the aspect of food! 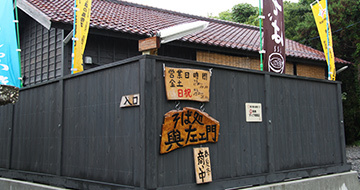 “Sado Kinzan Gold Mine G-grade Cuisine Society,” which is made up of eight restaurants in the Aikawa district, offers original menu items associated with Sado’s gold and silver mines. It was organized to promote the registration of the mines as a World Heritage from the aspect of food. 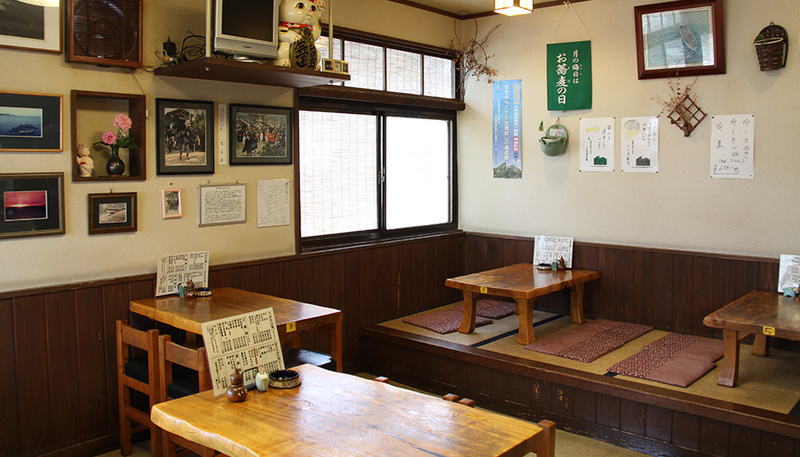 Each restaurant has developed its menu by making good use of its original features, and all of them have developed unique menu items. 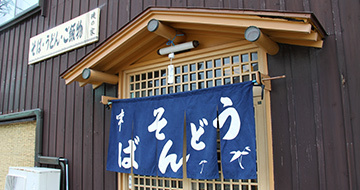 The “G” in “G-grade Cuisine” stands for “Gold” and “Gotochi,” which means “local.” When you visit Aikawa, please do enjoy their “G-grade Cuisine,” or tasty local food, to your heart’s content. Savor various dishes associated with the gold mine through both sight and taste. 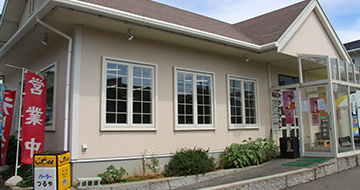 A farmhouse restaurant built by renovating a former residence for miners. 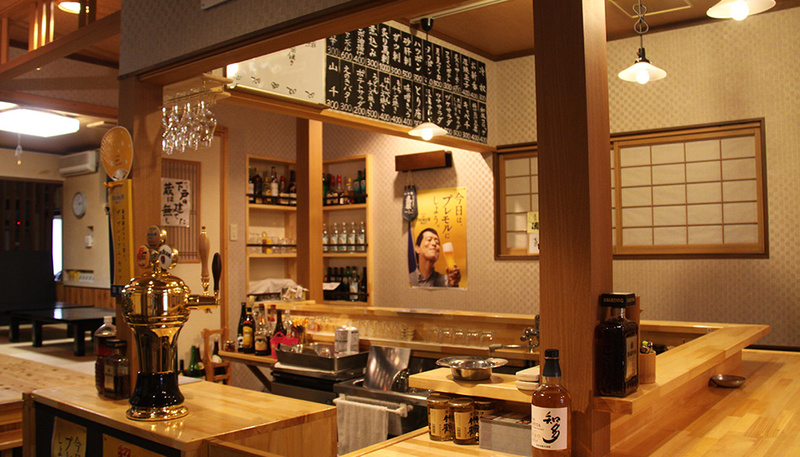 Original "Tateko" enables you to enjoy four different flavors at a time. This is a creative dish that provides different tastes as you go on eating. Four vessels, called warigo, with different kinds of food are stacked to make them look like Odate Tateko, the Grand Shaft built to convey ores. In the top warigo, you will find light and crispy tempura of seasonal edible wild plants like fatsia sprouts and butterbur scape. In the lower vessels, three kinds of noodle dishes― noodles with grated daikon radish, noodles with grated yam, and plain noodles―can be found. 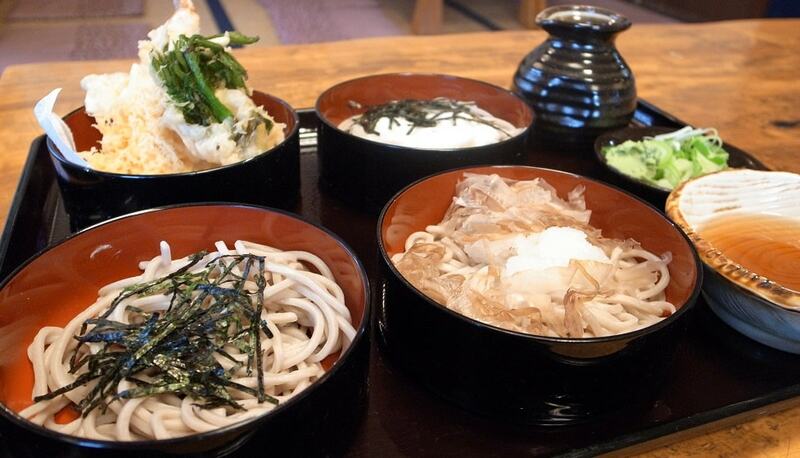 You can choose either soba (buckwheat noodles) or udon (Japanese wheat noodles). As you go on “digging,” you might find a sense of happiness!? 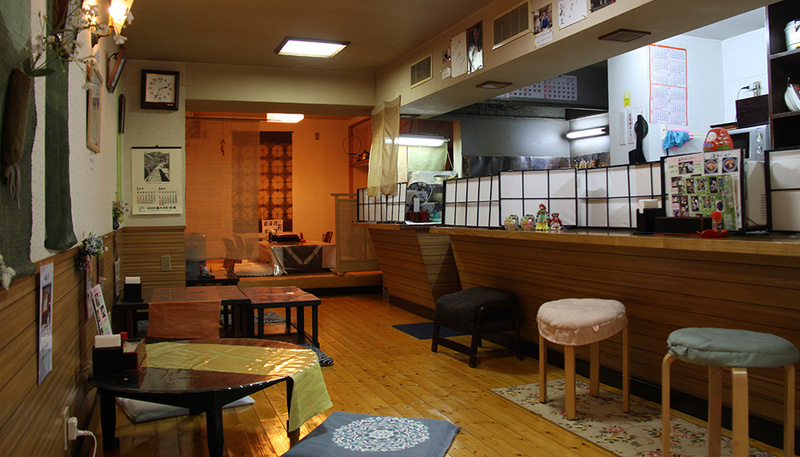 Serves soba and udon noodles and bowl dishes. Popular with both locals and tourists. 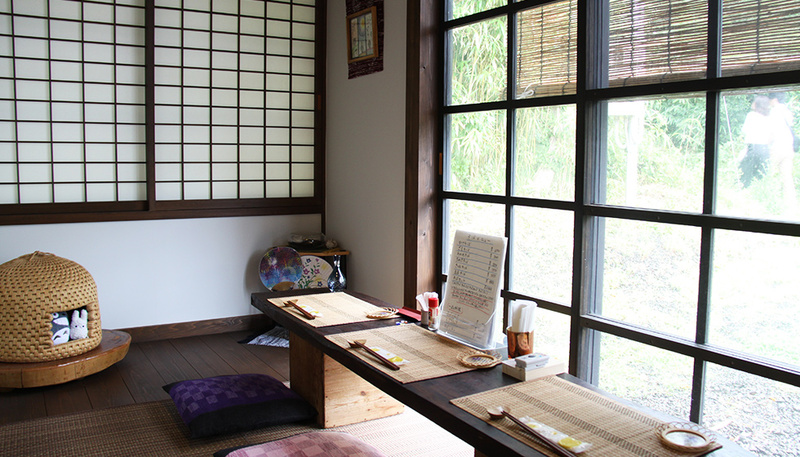 Yamamoridon (heaping bowl), with a hidden "treasure," is served to only ten people daily. 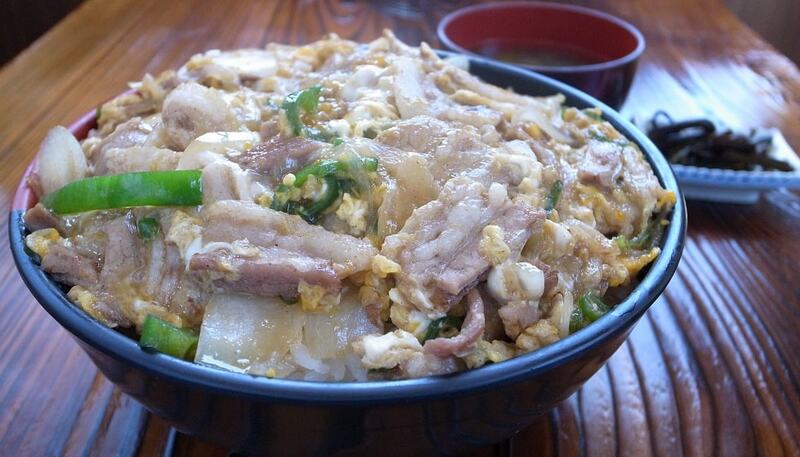 This is a very voluminous, original bowl dish, which weighs no less than 1.5 kilograms. Sado-produced rice is topped with pork, bell peppers and onions seasoned with a Japanese-style broth, which are heaped in a way that says, “Doesn’t this satisfy you?” What’s more, as you go on “digging” in the “mountain” studded with eggs symbolizing gold, you will discover a playful trick when you find three oval, gold coin-shaped, pork-fillet cutlets, dipped in a secret Japanese-style broth. How about trying to eat up all of this dish while pretending to be a prospector who sailed over to Sado with the dream of making a quick fortune? Voluminous, budget-friendly dishes will make you happy. The gold coin-shaped, deep-fried squid hidden in scrambled eggs is delicious. This creative bowl dish with the pleasing combination of deep-fried squid paste, is made by fully condensing the tastiness of squid and dazzling scrambled eggs. The fries are arranged so as to look like oval gold coins by kneading squid paste into a round shape and slicing it. The scrambled eggs are made moist and fluffy by adding broth, dogtooth violet starch and milk. This dish looks simple at first glance, but you will notice the head chef’s professional spirit in the details. 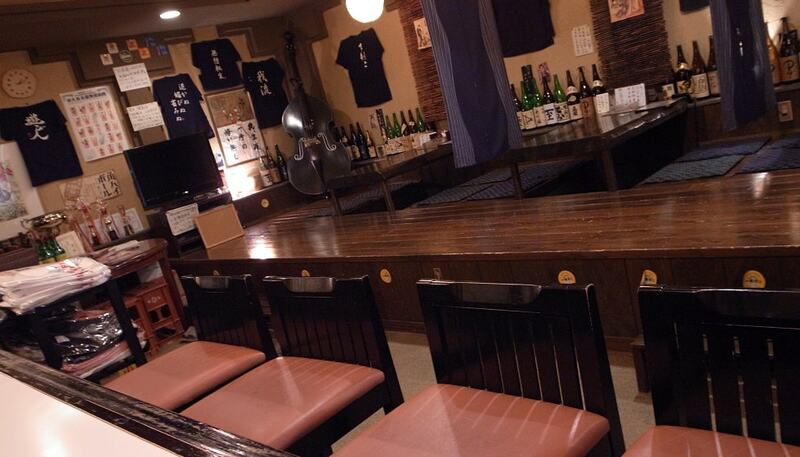 Serves as a Japanese restaurant during lunch time, and as an izakaya (Japanese-style pub) at night. You can enjoy Happy Hour from 5:00-6:00 PM. The ship carrying Sado's treasure sets sail for a world of bliss. 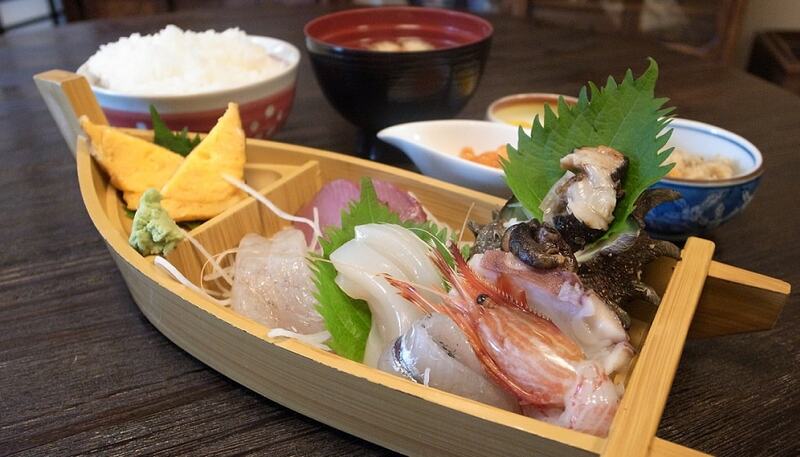 Ship-shaped Sashimi Combo, with a thick omelet (reminiscent of Doyu Tunnel) acting as the skipper, and loaded with a variety of Sado’s seafood treasures, enables you to enjoy, to your heart’s content, about seven kinds of fish and shellfish, such as turban shellfish, yellowtail and left-eyed flounder. 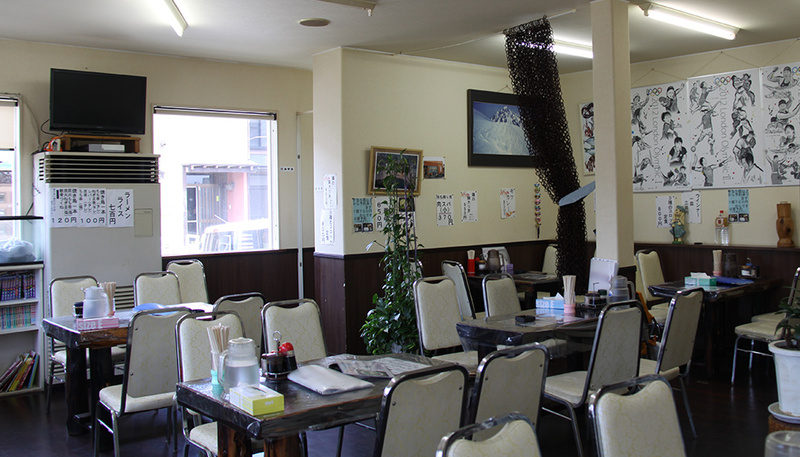 It is prepared skillfully due to the fact that this restaurant is under direct management of a fresh fish retailer. 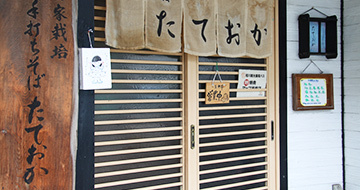 Cooks claim they will promote different ways of savoring fish by serving not only sashimi, but also fish prepared with one small adjustment, such as parboiling. If you rest easy like are aboard a big ship and savor the dish, the tastes will lead you into a world of bliss. 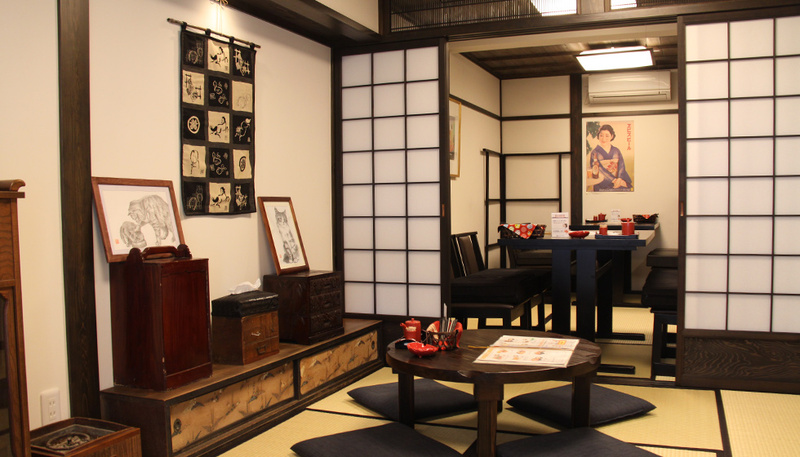 You can enjoy dishes prepared by making the most of women's sensitivity, in a space created by renovating an old Japanese-style house. Our Golden Japanese Omelet will make you feel at ease. 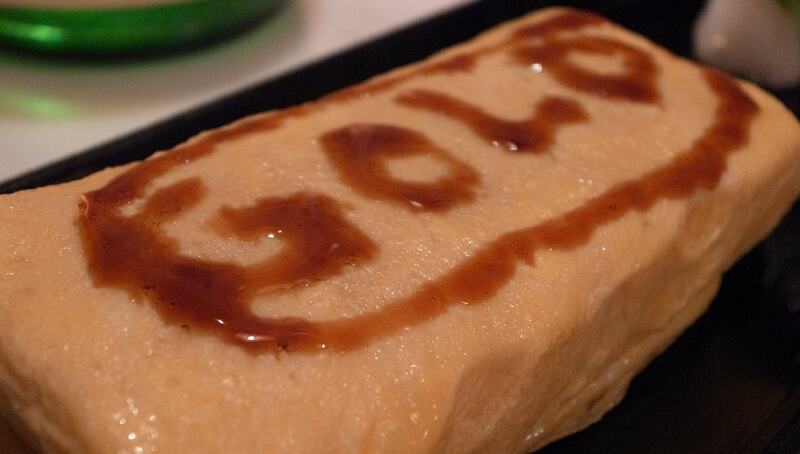 The word “GOLD” on the shiny surface of the Japanese omelet is impressive. This dish is made with fertilized eggs from free-range chickens raised in Sado’s rich nature. You can enjoy its thick and moderately sweet flavor to the fullest. To make it more golden, a little ingenious addition of elaborately made broth is used, too. Another feature is its profound flavor, which you can savor when you taste the letters written with boiled-down soy sauce along with the eggs. 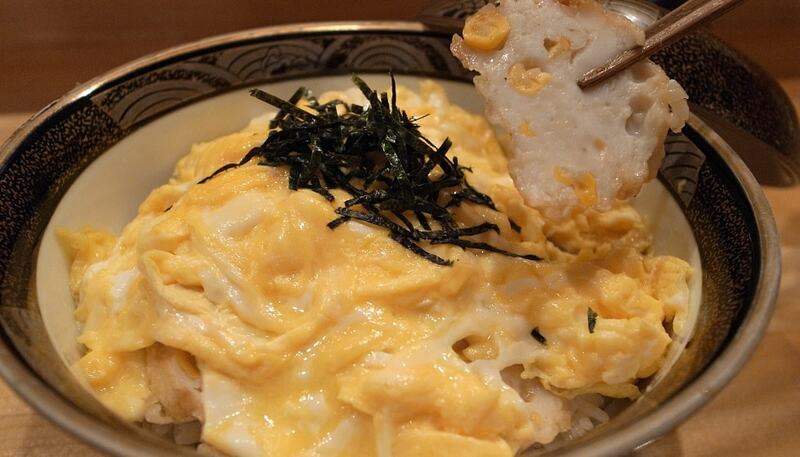 Since very rare eggs are used, they say this dish is limited to five people per day. Treat yourself to this dish by visiting this restaurant right when it opens. 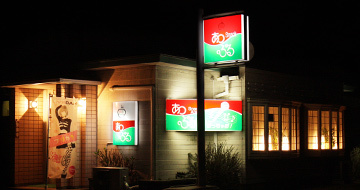 A creative cuisine restaurant, which uses as its trade name a word from the Sado dialect meaning "sloppy" or "perfunctory." This is a menu item which the master chef contrived while reminiscing about a teahouse on the mountain pass where the gold mine is located, and which was familiar to him when he was a young child. The massively thick omelet symbolizes “Doyu Tunnel,” while flower petals of the gold mine’s avenue are represented by thick sushi roll slices. Like a teahouse, dumplings with green and azuki bean jams are served along with buckwheat tofu, which enables you to enjoy the flavor of sweetened vinegar. 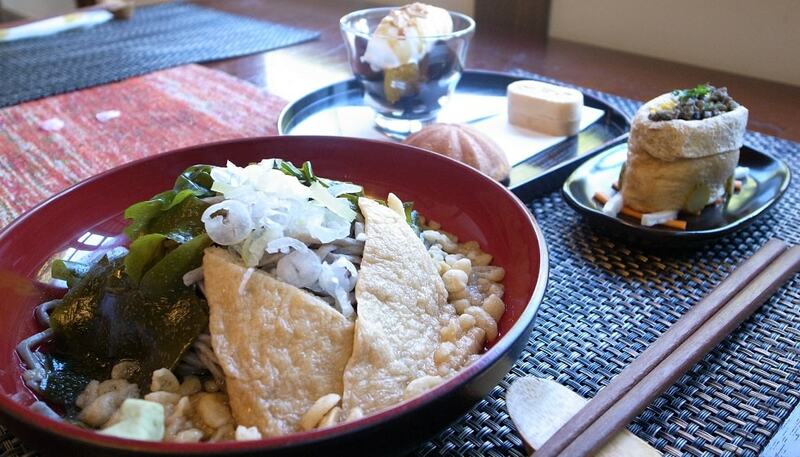 Of course, you cannot miss nihachi soba (buckwheat noodles made from 80% buckwheat flour and 20% wheat flour), which emphasizes the original flavor of soba. 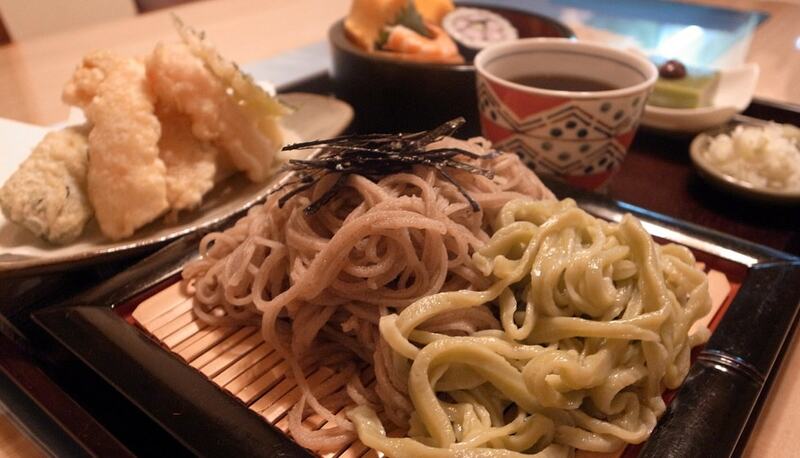 Also good is the refreshing flavor of udon noodles, into which matcha green tea is kneaded to evoke images of the vegetation in the mountains. While eating, you can immerse yourself in the feeling of walking over the pass. Open only during weekend lunch time, because the master chef does everything himself, from growing buckwheat to making noodles. 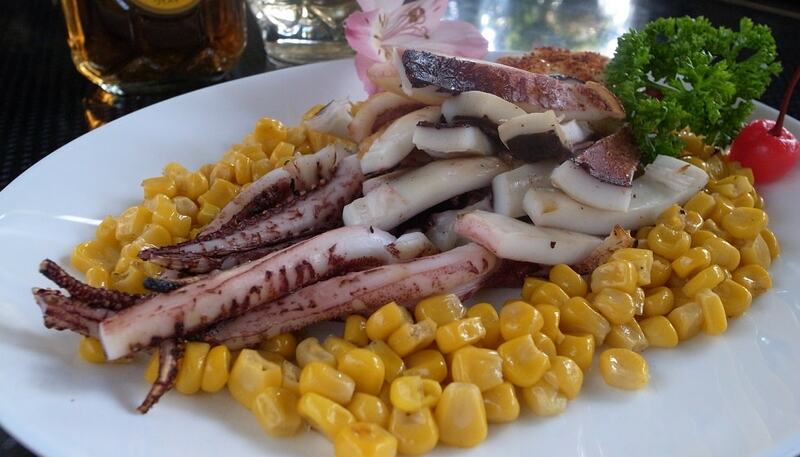 This golden combination enables you to enjoy a whole squid to your heart's content. A luxurious and ingenious menu item made with one of Sado’s specialties, a whole squid salted and dried overnight. 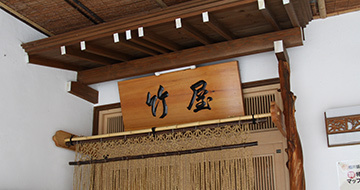 In the hope of making flowers bloom (becoming successful) once again in the land of Aikawa, the plate is decorated with seasonal flowers, and scattered with corn, which is used to resemble ichibukin (an old currency of Japan). The exquisite degree of grilling to keep the squid’s elasticity intact, and its harmony with butter-seasoned corn combined with mayonnaise sprinkled with cayenne pepper powder, is superb. This meal will induce you to consume more and more alcohol. The right way to wrap up your night is to savor the master chef’s top-recommended ramen. 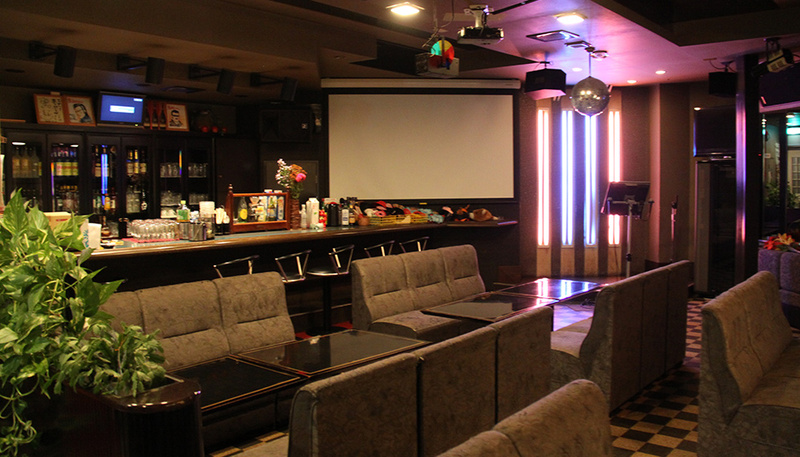 Enjoy karaoke, using various cosplay costumes and goods, plus the 100 inch giant display.